You are currently browsing the archives for the “Linda Addison” tag. From the outside it looks like a redbrick townhouse, with only a small sign above the door to let us know we’ve arrived at the KGB Bar – the place that both New York Magazine and the Village Voice have named the best literary venue in New York. Ellen Datlow, one of our hosts for the evening, is already there. She shows us to our seats, and within minutes people start arriving. I recognize some of them. There’s Nicholas Kaufmann, M. M. De Voe, Rick Bowes, Linda Addison, Gordon Linzner of Space and Time Magazine (editor emeritus), Vaughne Hansen of the Virginia Kidd Agency, and Will and Meesh Horner of Fantasist Enterprises. It’s going to be a fun evening. Some newer writers are also settling in, among them are Heather Sedlak and Tom Connair, MFA candidates from the graduate writing program at Seton Hill University; Andrew Alford, who’s made sales to Space and Time and Midnight Echo; and Nicholas Schwartz, a terrific young filmmaker who has recently option my story “Shooting Evil” for adaptation as a short film. Others are there as well. Too many to mention. Soon, the room is overflowing. Sarah Langan is also there, of course. We’re sharing the bill. She’ll be reading an excerpt from her forthcoming novel. I’ve selected three stories from Visions. Between the two of us, we have what seems a nice mix planned for the evening. Cohost Matthew Kressel kicks things off with the announcement of a Kickstarter campaign to help underwrite the continuation of the series. 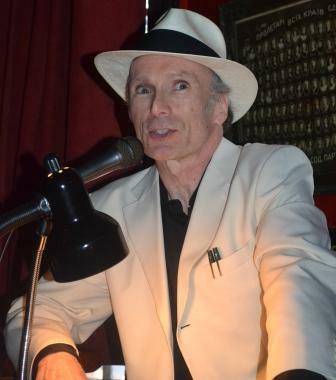 He also shares a list of upcoming readers, including Libba Bray, Lucius Shepard, James Patrick Kelley, and Thomas F. Monteleone. 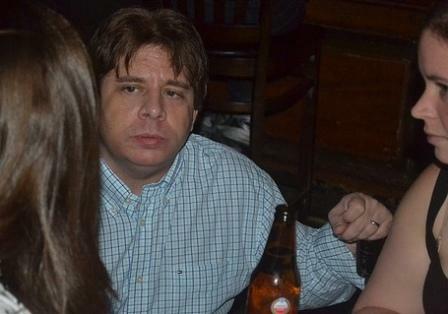 Listening to the list, I’m thinking I’ve got to move to New York so I can become a KGB regular. 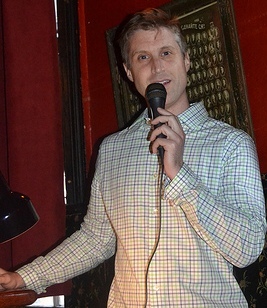 Then Matthew introduces me, and I’m on. The stories I’ve selected are “Step on a Crack,” “Prime Time!” and “Echoes.” I plan to deliver each from memory, a mode of presentation that harkens back to the roots of storytelling. Think Homer or the Beowulf poet, traveling scops who carried their works in their heads and presented their texts live without reliance on the printed page. I’ve blogged about this technique elsewhere, particularly in Scop 101. The stories are a bit like songs. They’re longer, of course. And they don’t employ rhyme. But each has a vocal rhythm that facilitates memorization. The audience is wonderfully receptive, and the performance goes well. 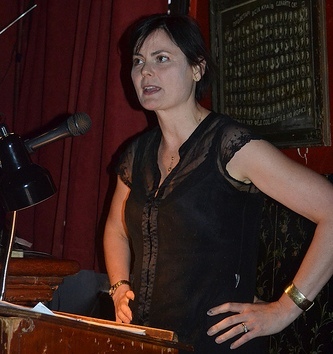 After a break, during which Will Horner does brisk business at the Fantasist book display, Ellen introduces Sarah – the three-time Bram Stoker winner whom the New York Times has referred to as one of “Shelley’s Daughters,” a strong writer of contemporary horror who carries on the groundbreaking work started by Mary Shelley. Sarah reads the first chapter from The Clinic, and it’s clear from the delivery that she has another Stoker contender in the works. The reading leaves us all eager for the book’s release. After the readings, about 20 of us head out to dinner at the Grand Sichuan Restaurant in St. Mark’s Place, after which Ginny and I make our way back to our Midtown digs. Special thanks goes out to our New York friend for getting us through the subway turnstiles and showing us the way. We never would have made it without them! Our original plans were to stay in the city one more day, but a gig at another nightspot – Riley’s Pour House in Pittsburgh – sends us packing in the morning. Still, I’m amazed at all we were able to fit into our short stay. There’s lots more to tell, including an account of my visit to GQ for lunch with former Twilingt Zone editor T.E.D. Klein. I’ll try to get to some of it in a follow up post. Look for it soon. 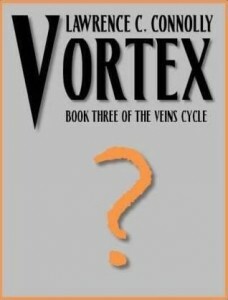 I’d also like to share the preliminary cover art for my forthcoming novel Vortex: Book Three of the Veins Cycle. If you were at the KGB and stopped by the book display after my reading, you got an advance look at what artist Rhonda Libby has planned for the conclusion of the series. If you didn’t, I’m going to keep you in suspense a little longer. The art warrants a blog post of its own. In the meantime, keep reading. And, as always – rock on! 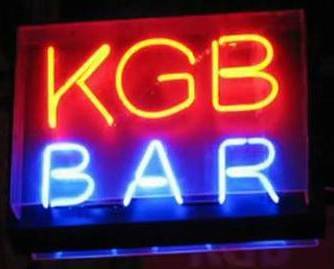 Screen cap of the KGB Sign is from the Fantastic Fiction at KGB Fundraiser video. 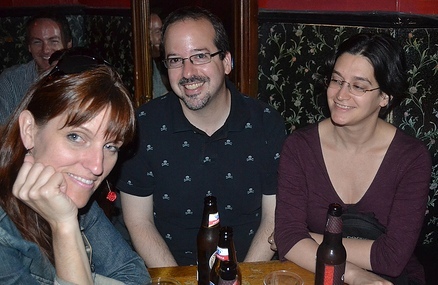 Photos of Milda De Voe, Nicholas Kaufmann, and Alexa Antopol; Tom Connair and Heather Sedlak; Matthew Kressel; Lawrence C. Connolly; and Sarah Langan are © Ellen Datlow. 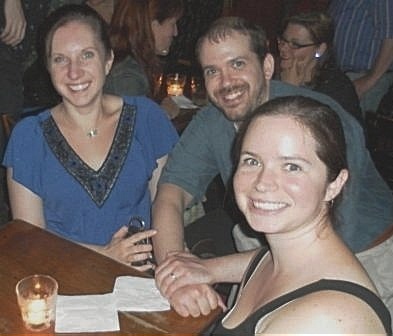 Photo of Meesh Horner, Will Horner, and Heather Sedlak is © Lawrence C. Connolly. Powered by WordPress and delivered in 0.270 seconds using 39 queries.